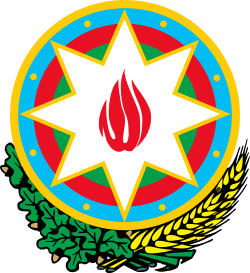 The Red Army invasion of Azerbaijan, also known as the Sovietization or Soviet invasion of Azerbaijan, was a military campaign carried out by the 11th Army of Soviet Russia from 27 April to 11 May 1920 to install a new Soviet government in the Azerbaijan Democratic Republic, a former territory of the Russian Empire. The invasion coincided with the anti-government insurrection staged by the local Azerbaijani Bolsheviks in the capital Baku. We absolutely must take Baku. Direct all your efforts to this end, but it is necessary to remain strictly diplomatic in your statements and to ensure to a maximum extent a solid preparation for the local Soviet power. Same applies to Georgia, although in this case I advise you to be even more careful. 1. For the commander of 11th Army to cross the border Azerbaijan on April 27 and, in a quick offensive, to take control of the Baku province. Yalama—Baku operation to be concluded within 5 days. The cavalry units must be sent to take control of the Transcaucasian railroad around Kurdamir. According to the Russian historian A.B. Shirokorad, the Soviet invasion of Azerbaijan was carried out using a standard Bolshevik template: a local revolutionary committee starts real or "virtual" worker riots and requests support from the Red Army. 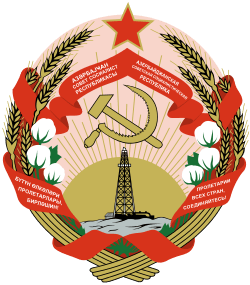 This scheme was used also decades later, during the Soviet invasions in Hungary (1956) and Czechoslovakia (1968). 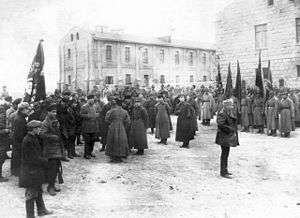 On 28 April 1920, the Baku Revolutionary Committee filed a formal request for help with the Soviet Russian Government. But a day before, the 11th Red Army, including the 26th, 28th and 32nd rifle divisions and 2nd mounted corps (over 30,000 soldiers), already invaded the territory of Azerbaijan. Shirokorad, Aleksandr B. (2006). Великая речная война, 1918–1920 годы. p. 416. ISBN 5-9533-1465-5. Kazemzadeh, Firuz (1950). The Struggle for Transcaucasia (1917-1921). Anglo-Caspian Press Ltd. p. 360. ISBN 978-0-9560004-0-8.